Windows 7 is a personal computer operating system developed by Microsoft as part of Windows family of operating systems. It is used by both consumers and businesses. Windows 7 is a unique product and help users with all their activities on computer. Windows 7 can be installed by downloading or from a CD purchased at retail outlet. Windows 7 is bundled with advance features to make your system function smoothly that only certified technicians can fully understand. As sometimes Windows 7 installation can run into problems such as conflicts with pre installed windows, blockage from viruses, multi-device license management, or product key recognition issues. GuruAid's experts can help install and configure windows on your computer as per your requirement. Computer hardware and software are becoming more complex. Also growing nature of security threats is becoming more problematical. Windows 7 is no exception. 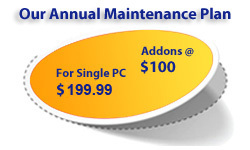 Though Windows 7 does auto repair itself in-case of any damage from spyware & malware. But some viruses do manage to enter the system & infect it, which affects system’s performance. Other common problems experienced with Windows 7 are application crashing, missing explorer folders, multifunctional printer issues, driver installation error, XP mode not working, and many more. No matter how complex the problem is you can count on our GuruAid’s certified technicians to spend as much time necessary to fix the problem until you are completely satisfied. Microsoft Windows 7, like all other products, can get bloated after some time. As you surf the net, download apps, add new programs, and clutter your computer with unnecessary data, you will slow down your computer. Malicious spyware & viruses become home to your computer. Simple tasks such as starting and shutting down Windows can take long time. Even your Windows 7 needs to be optimized to higher settings for better performance. Our technicians know all the tricks of the trade to clean-up, speed-up and tune-up your PC so that it regains its past glory. We can also help you upgrade your Windows 7 to Windows 8 or solve any compatibility issues with 7. All computers, in addition to Windows 7 are bundled with a broad range of software products, utilities, and tools. Windows 7 is loaded with advance features like "jump lists" for easy access to all your data, "remote media streaming" to enjoy music even if you are not at home, Windows taskbar gives ease for customizing your system & many more. The guidelines are provided by Microsoft but at times can be confusing for some users. We at GuruAid can help you make sense of all the new feature-functions of Windows 7 and get the most out of your computer.